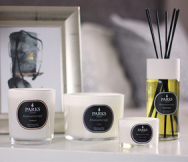 Parks Candles’ Number 6 Luxury Gift Set includes everything you could possibly need to improve the mood in your home. It combines a natural reed diffuser with 100ml of our finest citrus and lime scent, as well as a pure, natural wax candle of the same scent. In aromatherapy, aromatherapists generally use citrus scents to dispel stress, treat various anxiety-based issues and even lessen nausea or digestive complaints. They are spicy and piquant but never intrusive, and few people have bad feelings about naturally derived, carefully preserved and beautifully presented citrus scents. Lime essential oil is particularly praised by aromatherapists and alternative treatment practitioners as being a stimulating, refreshing scent that cleans and clears away unhappiness or depression. When inhaled, it is considered to be a tonic that can help to alleviate stress, exhaustion and several kinds of anxiety. In addition to being popular purely as a scent, essential oil of lime is used to scent this candle and many use the reed diffuser liquid to ease their coughs, sore throats, chest congestion and even sinusitis. Many even believe it can ease the symptoms of the common cold. The scent certainly makes one more comfortable, even at the worst of times. This is intended as a gift set and comes in a fine presentation box. The hand poured, vased candle will burn for approximately 50 hours whilst the reed diffuser kit provides you with everything you need to keep an area deliciously scented for 10 to 12 weeks.